Does your facility use or create small containers of chemicals, such as solvents, laboratory waste, paints, acids, toxics, cleaners, etc.? It is common for a laboratory, hospital, school, medical facility, or manufacturer to generate these kinds of waste. We often see these types of containers accumulate and grow outdated, partially used, leaking, contaminated or they are simply no longer needed and are now classified as a regulated hazardous waste. These chemicals take up valuable storage space and create an unnecessary environmental health and safety risk in the workplace. Some chemicals become unstable with age. Picric acid, for example, can develop crystals on the cap of a closed container and these crystals have the potential to explode violently when disturbed. Old compressed gas lecture bottles can become very dangerous if the valves have rusted. Aerosol cans of paint, printed circuit board cleaners and degreasers are also hazardous waste. The solution to managing these small containers of hazardous waste is a lab pack. A lab pack is a method of managing containerized hazardous and non-hazardous materials (including laboratory chemicals and samples, cleaning supplies and maintenance supplies) of five gallons or less for transportation and ultimately, disposal. Only containers that are equal to or smaller than 5 gallons are eligible for lab packing. However, no matter how small the container, the chemicals inside can be extremely dangerous. Containers larger than 5 gallons, such as plastic bins and steel drums, can still be managed by MLi Environmental. as a bulk hazardous material. MLi Environmental sends chemists who are trained in chemical recognition and compatibility to perform same day lab pack services at your facility. All services are performed in strict compliance with all applicable EPA, DOT and OSHA, regulations. When on-site, our chemists require minimal supervision and only call for a signatory authority upon completion of the pack. The lab pack chemist will work through the disposal process of identifying, categorizing, and segregating each chemical in accordance with EPA and DOT regulations and guidelines. 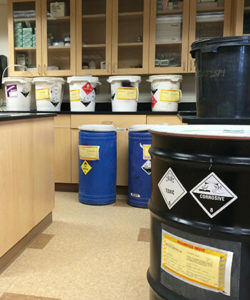 An inventory (packing list) is created and then the chemicals are packaged into a drum that depending upon volume can be 5 to 55 gallons in size. An absorbent substance, such as vermiculite, is then added to the filled container prior to final closure and shipment. We provide all necessary paperwork, including the hazardous waste manifest, packing slips, land disposal restriction forms, proper labels and container markings. We are here to help. Should you find yourself in need of a chemical lab pack of any size, request a free consultation online or call us directly.